Garcia y Vega Elegantes Cigarillos guaranteed smooth taste and freshness is derived from their promise that every cigar that they make should taste extraordinary. These Garcia y Vega's Elegante Cigarillos are made with carefully aged filler tobaccos and selected natural leaf wrappers to ensure a supreme taste and aroma. These Garcia y Vega's Elegante Cigarillos are available in a wide selection of sizes and natural leaf wrappers. Garcia y Vega English Corona Cigarillos guaranteed smooth taste and freshness is derived from their promise that every cigar that they make should taste extraordinary. These Garcia y Vega's English Corona Cigars are made with carefully aged filler tobaccos and selected natural leaf wrappers to ensure a supreme taste and aroma. These Garcia y Vega's English Corona Cigars are available in a wide selection of sizes and natural leaf wrappers. Garcia y Vega English Corona Cigars guaranteed smooth taste and freshness is derived from their promise that every cigar that they make should taste extraordinary. These Garcia y Vega's English Corona Cigars are made with carefully aged filler tobaccos and selected natural leaf wrappers to ensure a supreme taste and aroma. These Garcia y Vega's English Corona Cigars are available in a wide selection of sizes and natural leaf wrappers. Garcia y Vega has been a legend in the value-cigar market since 1882. Now comes the newest version to the Garcia y Vega family of cigars, the Garcia y Vega Game. The Game series was created with a passion for today's cigar smoker's preferences. Available at Thompson Cigar, the Game Palma (Green) blend is a mild, slow burning Candela with a smooth, sweet flavor, and each cigar is sealed in “Foil Fresh” packing for maximum freshness. Garcia y Vega Miniatures Cigarillos guaranteed smooth taste and freshness is derived from their promise that every cigar that they make should taste extraordinary. These Garcia y Vega's Miniatures Cigarillos are made with carefully aged filler tobaccos and selected natural leaf wrappers to ensure a supreme taste and aroma. 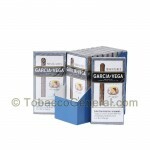 These Garcia y Vega's Miniatures Cigarillos are available in a wide selection of sizes and natural leaf wrappers. Garcia y Vega's Pops Cigarillos guaranteed smooth taste and freshness is derived from their promise that every cigar that they make should taste extraordinary. These Garcia y Vega Pops are made with carefully aged filler tobaccos and selected natural leaf wrappers to ensure a supreme taste and aroma. 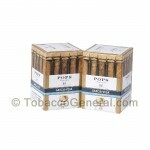 These Garcia y Vega Pops Cigarillos are available in a wide selection of sizes and natural leaf wrappers. Garcia y Vega Cigarillos Sweet & Mild Cigars guaranteed smooth taste and freshness is derived from their promise that every cigar that they make should taste extraordinary. These Garcia y Vega Cigarillos Sweet & Mild Cigarilos are made with carefully aged filler tobaccos and selected natural leaf wrappers to ensure a supreme taste and aroma. 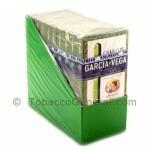 These Garcia y Vega Cigarillos Sweet & Mild are available in a wide selection of sizes and natural leaf wrappers.